Ben H. Winters' THE LAST POLICEMAN Wins an Edgar Award! - Joelle Delbourgo Associates, Inc.
Ben H. Winters’ THE LAST POLICEMAN Wins an Edgar Award! Last night, I had the pleasure of attending the Mystery Writers of America’s annual Edgar Allen Poe Awards at the invitation of Quirk Books, publisher of one of the one of the nominees in the “best paperback original” original category. 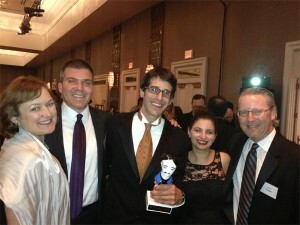 Turns out the amiable author Ben Winters dresses up really nice in a tux, and so does his publishing team (at left)! Ben’s THE LAST POLICEMAN, which has been characterized by one blogger as “apolocalypse noir” features a young detective who has the misfortune of trying to solve his first case in a world gone badly wrong. With an asteroid set to collide with the earth in six months, everything in Hank Palace’s world is breaking down. And yet Palace doggedly persists in trying to do the right thing. It’s a great premise for the first in a trilogy of novels that blend the best of mystery with elements of science fiction and just plain old great storytelling that characterizes the best of these genres. The increasingly chaotic and dark world Winters’ has created is compelling and his protagonist Hank Palace becomes the moral center. When THE LAST POLICEMAN was announced as the winner, I have to confess I shrieked. But the photo below was taken minutes before, in a calmer moment. 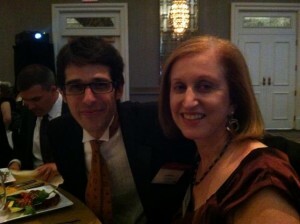 Thanks to Ben’s brilliant editor, Jason Rekulak, his energetic and visionary publishing team at Quirk. It was a night to remember. And Quirk will the sequel to THE LAST POLICEMAN, COUNTDOWN CITY this summer, so there’s much to look forward to.